The biology of alligators is an ancient tale of survival. Florida’s history of gators and humans is closely intertwined. As Florida’s population and developed areas have grown, human/gator encounters have increased. Lakes dug during the development of Florida subdivisions have invited alligators into our backyards. Learning to live safely with these fascinating reptiles ensures our safety and their survival. Do not feed gators… report to the police anyone who does. Although humans are not generally viewed as prey by alligators, a fed gator is taught to see humans as food. Keep children and pets away from edges of lakes, ponds, rivers, canals, and all freshwater. It is never safe to play near freshwater in Florida. Alligators do not live in saltwater but are occasionally seen swimming there especially in times of drought. Never swim in fresh water in florida except in designated areas. 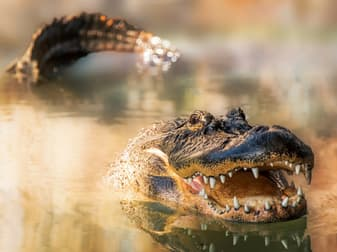 The majority of the few human deaths from alligator attacks in Florida were people swimming where they should not have been. Binoculars are the safest way to observe alligators. Approaching closer than 20 Feet is risky. In the blink of an eye, an alligator can jump 6 feet into the air from a resting position and run extremely fast. Become the neighborhood gator greeter – Make alligators a topic of conversation with your neighbors …especially renters and new homeowners. Encourage them to talk to you about the alligators they have seen. Help them figure out if the gator they saw was a gator being a gator or a gator displaying behavior dangerous to humans. Let your lawn care and other workers know they will lose their jobs if they feed an alligator. Encourage them to report problem gators for the safety of all. Fence all neighborhood pools to keep gators out. Keep fenced areas for dogs away from the water. Post gator caution signs on waters edges. Place alligator educational packets in all rental units. Mowing grass to water edges invites gators to bask…instead plant a vegetation buffer to keep gators by water edges. Call SCCF for help with this. Remember… Every alligator over 4 feet long reported to the police if caught by the trapper is killed … whether the gator is a threat to humans or just basking in the backyard sun. Let’s make sure we are only “harvesting” the dangerous ones. To learn more about these living dinosaurs, call SCCF at 472-2329. You can find a printable brochure here [pdf].